Leg press technique is simple, but cheating on it greatly reduces the effectiveness of the exercise. Although the leg press is no replacement for the squat, leg presses are a great supplemental leg exercise for your training program if done correctly. Using proper leg press technique, you can hammer wheels you’ve already pumped with your squat session. The leg press is no substitute for the squat! It is, however a great assistance exercise to the squat. Now that that’s out of the way, the leg press is used to build your quads, and also works your hamstrings and glutes. If you do them right, your quads will feel like they’re on fire by the time you’re done! Before starting the exercise, make sure the back pad is set properly so you can complete the full range of motion. The lower you set the pad, the deeper you will be able to bring your legs. The greater the range of motion, the more effective this exercise will be. The greater the range of motion, not the greater the weight. Sit into the leg press and grip the handles at the bottom of the press. Grip the handles throughout the lift to prevent your back from coming up off the pad, and to eliminate the tendency to push your legs with your hands and assist (cheat) in the lift. Place your feet on the platform. 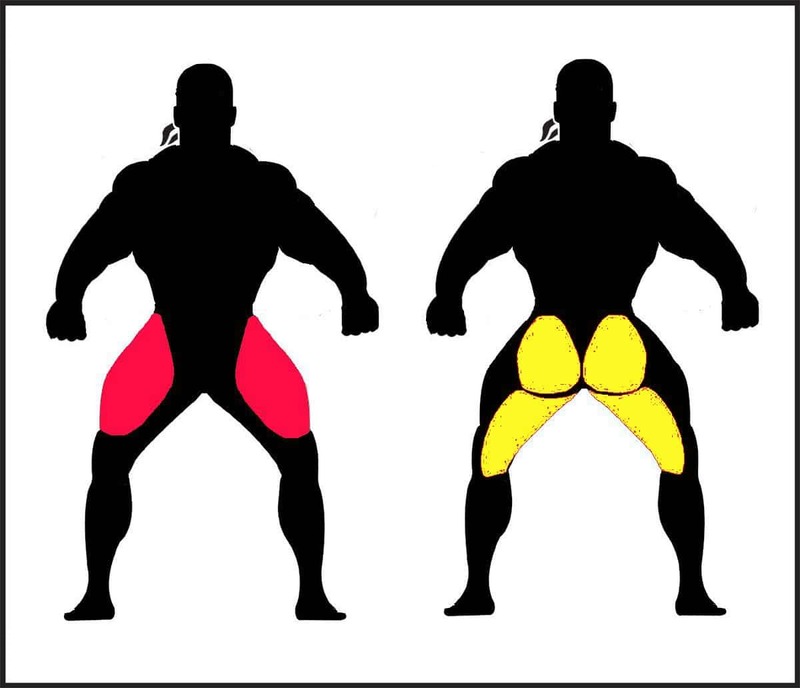 Unless you are focusing on a specific muscle group (see Variations below) foot placement should be similar to the placement you use on your squats. Take a deep breath into your chest and lower the platform in a smooth, controlled fashion until your thighs touch your torso. You may have to exhale slightly as your legs press against your body. Without pausing press the platform back up. Exhale your breath as you complete the lift. Do not let your knees lock out at the top between sets. Select a weight that you can perform all of your repetitions using proper technique. On your last 1-2 sets, your last repetitions should be very difficult, but you should continue to complete the full range of motion on all reps.
Don’t brag about the weight you push on the leg press. No amount of weight on the leg press is ever impressive. Partial Repetitions: set the back pad as low as possible and bring the platform down until your thighs are pressing against your abs and chest; completing partial repetitions greatly reduces the effectiveness of the exercise. Locking your knees at the top: don’t allow your knees to lock out at the top, keep the tension of the weight on your legs throughout the exercise – that is what creates the burn! Pushing your knees with your hands: keep your hands on the handles, if you cannot complete the lift without assistance then reduce the weight.